Fear. 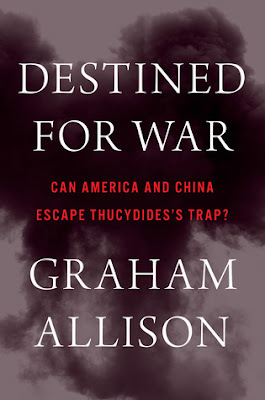 Allison has the advantage of recent discoveries in behavioral science which show that “at the basic psychological level…people’s fears of loss (or intimations of ‘decline’) trump our hopes of gain—driving us to take unreasonable risks to protect what is ours.” Applied to the present day, America shouldn’t allow fear of China’s stupendous rise to make policy makers forget what is their strategic interest: preserving the free nature of their democracy and fundamental institutions and keeping its people strong and resilient rather than preserving a heretofore unchallenged primacy over the western Pacific. Allison asks why we think we need to preserve that primacy at any cost. China has finally turned its face to the world and intends to engage. History shows us they have a core belief in the superiority of the Middle Kingdom, so we can expect a fierce nationalism. Allison suggests we need to dial back actions and policies that strengthen an unreasonable hard-line nationalism in China that brooks no opposition. We should be expecting to live with this new rising power and chill with rhetoric that clouds an understanding of what our goals actually are in a changing world. Allison teaches a class at Harvard which discusses instances of Thucydides’ trap—that is, when a rising power confronts a current power the result is war—playing out through history, so he’s had plenty of opportunity to hone his argument. It shows in the smoothness of the argument and clarity of the history he tells to bolster his thesis. We get examples of an established power feeling threatened by a rising power and the conditions under which this resulted in war and when it did not. Two recent examples would include England and Germany before WWI (1860-1913), and also the United States and the Soviet Union after WWII. One might argue relations between the two did precipitate an outbreak of hostilities: the Cold War. However, Allison argues the "cold" nature of the relationship during this period is an example that war is not inevitable. President Trump has made clear that the US will no longer, while he is president, take a leading role as protector without a kind of tributary role being played by smaller states. China is pleased to take on the role of protector that the U.S. appears no longer to want. In the end, the present American administration may simply move aside to accommodate China without a clear foreign policy strategy. However, American president Donald Trump is anything but predictable and stable. And, Allison reminds us, when states repeatedly fail to act in what appears to be their true national interest, it is often because their policies reflect necessary compromises among parties within their government rather than a single coherent vision. This is true right now in the U.S.; the thing that brings us down may be ourselves rather than China. Thucydides himself believed fear was at the primary driver at the root of the Peloponnesian War, when a rising Athens threatened Sparta. Donald Trump went out of his way, during the 2016 presidential campaign at least, to hype a type of fear in America about China’s rising militancy and wealth. He almost seemed to open his arms to conflict. The destructiveness of such a contest between the East and the West would be so catastrophic as to be almost unimaginable. Of course Thucydides’ trap is not inevitable, but we must find leaders with great understanding.